Adam, Man-At-Arms and Orko are searching the forest for Salkweed needed for Man-At-Arms’ experiments. But a storm strikes and Orko finds himself separated from his friends, and runs into a the clutches of a giant. He faints from shock, but awakens to find the giant has returned him to his friends- and not only that, but the giant has also delivered them a supply of Salkweed! The giant moves on before the heroes can ask him who he is and how he knew what they were looking for- but before long, both Orko and the giant are captured by the owner of a travelling Freak Show, who is making easy money by capturing human and animal oddities and displaying them as freaks. 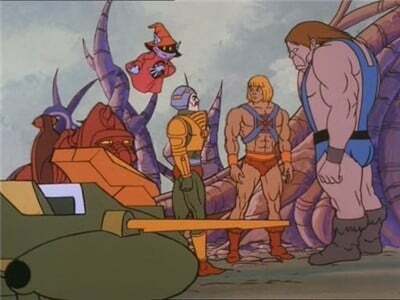 As He-Man sets out to rescue them, the giant begins plotting an escape plan, surprising Orko with his incredible intelligence, and friendliness in spite of his appearance.